In the unlikely event that you are on the Net, reading this post, and you are unfamiliar with Longcat, we shall begin with a brief introduction of perhaps the world's most famous feline. Astoundingly, Wikipedia seems not to have an entry for Longcat (yet), so my own general understanding of the phenomenon will have to do. 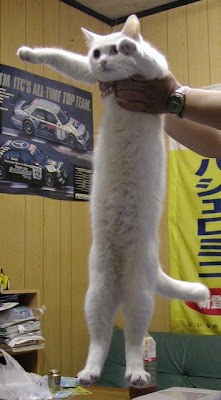 On account of the cat's accentuated length in the image, it became known as "Longcat," and moreover gave rise to the associated exclamation "Longcat is long." (Or, as it is more often inscribed, "Longcat is LOOOOOONG." For this phrase and the habit of adjectival reduplication which it has engendered, see Urban Dictionary.) The image itself and the revelatory declaration of Longcat's length soon gained widespread popularity online, inspiring several variations on the theme, ranging from alternate Longcats (to be addressed in a future post) to the somewhat less popular Widedog. We will be devoting a few posts to examining Longcat with our Rappaportian lens, though our focus to begin with will be less on Longcat itself than on the quality of its length. That is, today we shall consider the statement "Longcat is long" as an ultimate sacred postulate. As a discursive object, "Longcat is long" possesses the primary formal characteristics of ultimate sacred postulates. While the statement's referent — the white cat — is not non-material or even empirically out of reach (like deities or world-pervading life forces), it is relatively inaccessible to the vast majority of people, except through available images. (We will address the issue of the referential accessibility of Longcat below.) Its content is minimal and vague: the postulate only tells us that Longcat is long, specifying neither exactly how long nor giving any standard of length against which Longcat may be measured. Because of this vagueness, the statement is by and large not subject to disproof — short of flatly rejecting the postulate altogether (and this is difficult on account of images which suggest that Longcat really is long), it cannot be proved that Longcat is not long. As such, the longness of Longcat becomes discursively unquestionable, which is to say it becomes sacred. This sacrality could at least potentially be called into question because the original photograph of Longcat is widely available. Based on the image, someone with time to spare could probably make a fair estimate of how long Longcat actually is. With a discreet figure for Longcat's length emerges the possibility of comparison with other cats, which might demonstrate that Longcat is actually of only average length for felis domesticus, or — perhaps worse — that, even though Longcat may genuinely be quite long, other cats have been documented to be longer. (Though, as a believer in Longcat, I am obligated to note that the very idea is blasphemous and absurd.) In a word, because the postulate does have an actual material referent, and because this referent is at least hypothetically accessible and measurable, the postulate itself that "Longcat is long" could be empirically challenged. Here the original photo has been altered to extend the cat's length to obviously extraordinary proportions. While the image is a crude copy-paste job, it nevertheless presents itself as a photograph, a genre which purports to capture the genuine. By lengthening the original and presenting Longcat as truly and undeniably long, the author of this image has made the photograph into something of an icon, an image sacred because it embodies — even more undeniably and unquestionably than the original — that Longcat is long. At the same time, it retains something of the photographic quality of the original from which it was made, impressing upon the beholder some remnant of realism, however faint. While I hardly imagine such was the intent of the creator, I regard this image as a sort of defense against the discursive threat to "Longcat is long" posed by the degree of empirical accessibility which remains on account of the availability of the original photo. While I imagine some readers may find it tiresome to scroll through 15,200 pixels of copy-and-pasted Longcat, I feel the experience is necessary to understand the import of this image, probably the longest altered version of the original photograph. It truly speaks for itself. As an aside, I wonder if, for the creator of this image, the potentially tedious and repetitious process of producing the extended image, section by section, became some kind of devotional exercise. One can almost imagine a cloisterful of monks, piously hunched over their computers, painstakingly producing endlessly extended edits of Longcat while reciting the wisdom of Anonymous as scripture. More images of interest will be examined in the next post. These few exemplify the project to visually represent the postulate "Longcat is long" in such a way as to bolster its unquestionableness, its sanctity. I welcome any corrections to this post's introduction from anyone more knowledgeable on the details of Longcat's origin. Finally, I promise I will only post an image as huge as Fig. 3 one more time. Anonymous: Thanks for noting that remarkable piece of Longcat art. Actually, it is discussed at some length in the next post. I enjoyed that observation, and the interesting take on internet culture as a religion unto itself.